C. F. Martin D-18 Model Flat Top Acoustic Guitar (1941), made in Nazareth, PA, serial # 77666, natural lacquer finish, mahogany back, sides and neck, spruce top, rosewood fingerboard, black hard shell case. 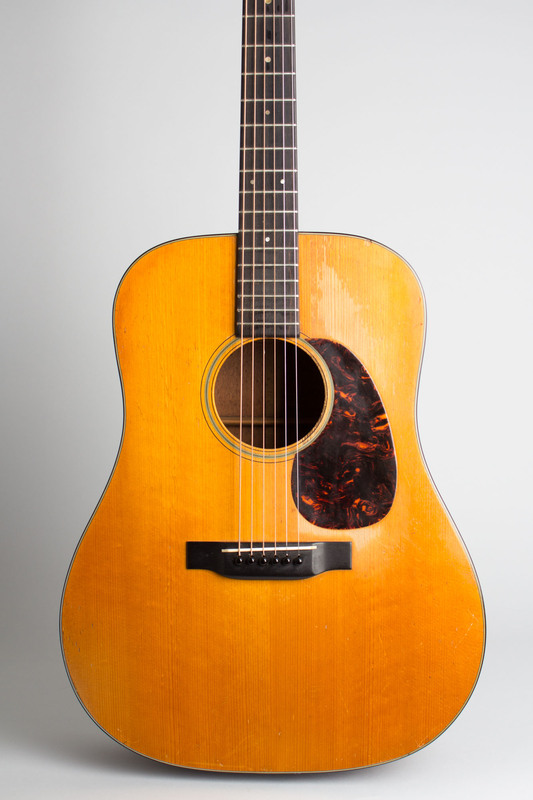 There are certain guitars that are simply the standard by which all others are judged; the Pre-war Martin D-18 is certainly one of them. 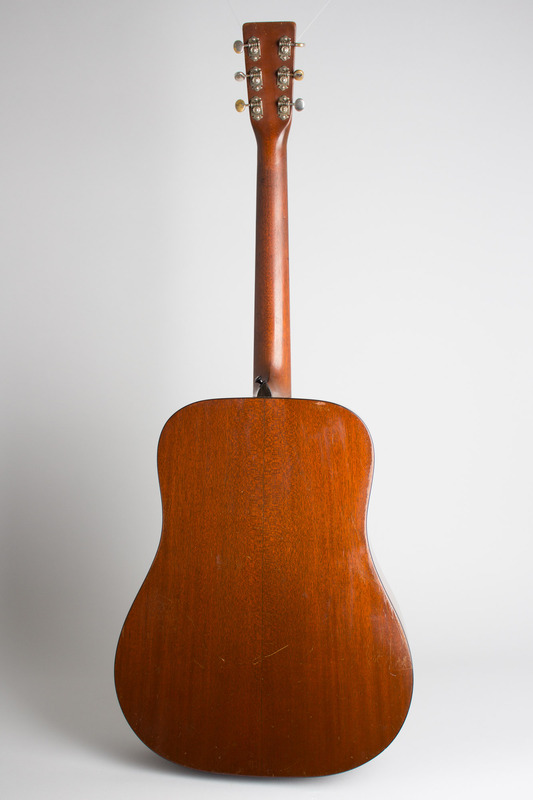 This early 1941 example shows some playwear repairs, but is still in excellent playing condition and has the expected sound in spades. The power and depth of a Dreadnought combines with the sweetness, sparkle, and singing character of the best pre-WWII mahogany Martins in a magical mix, an exceptionally versatile flat-top guitar suited to practically any musical situation. 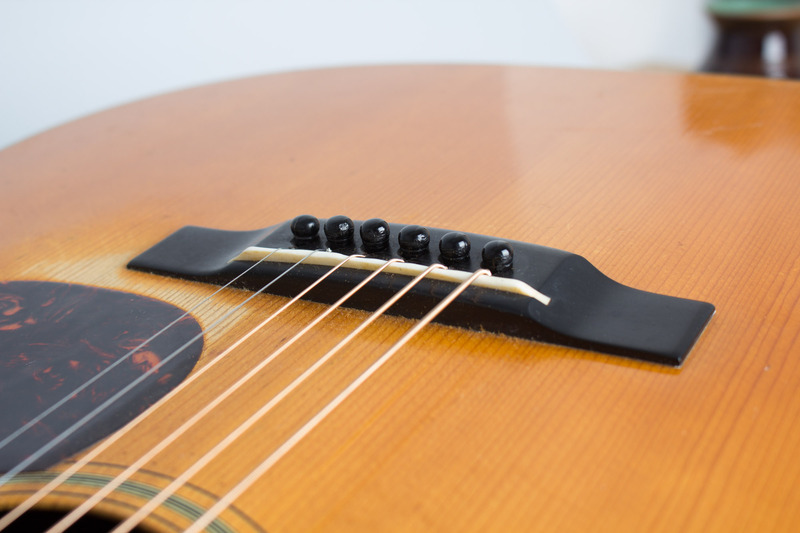 The wear on this guitar is typical in many ways of how these instruments originally got used. Cosmetically it shows some evidence of heavy playing, likely into the open mikes of radio or barn dance stages. In this environment a guitar had to have both depth and projection, and a large percentage of the Country and Western performers of the period found the Martin Dreadnought the best instrument for this environment. 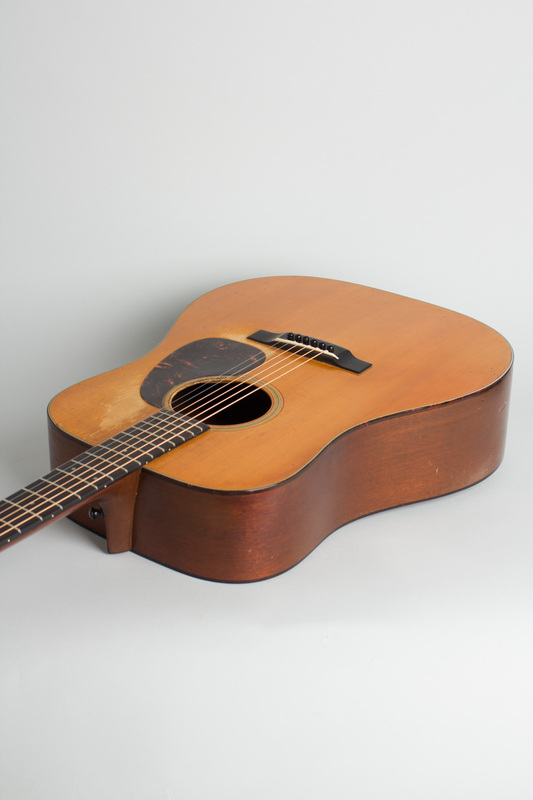 Costing an even $75 without case in summer 1941 (when this one would have originally been sold), the D-18 represented a sizable investment and once obtained was often played constantly as a tool to put food on the table. 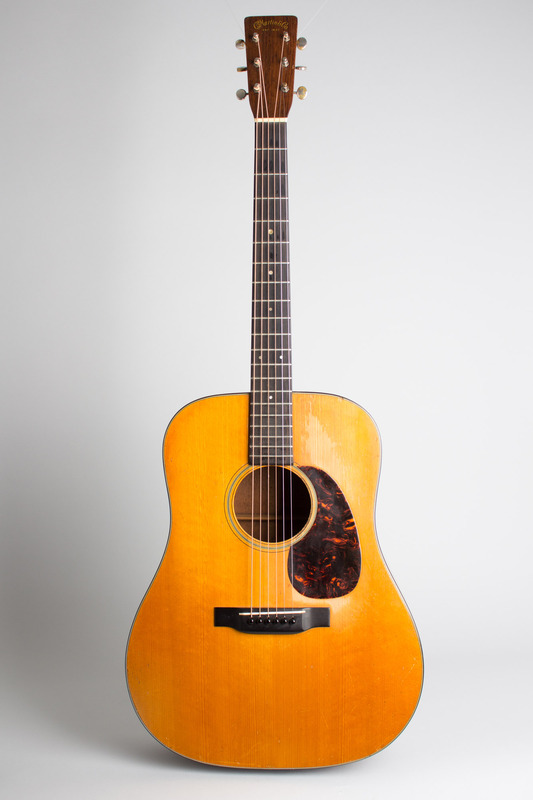 This D-18 shows the original classic features of the model, widely imitated ever since. The back and sides are Honduras mahogany and the top is tight-grained Appalachian spruce, bound on the outside with tortoise celluloid. The ebony bridge has a canted bone saddle. The pickguard is made of tortoise celluloid in a small "teardrop" shape; this design often proved too small to fully protect the top from the ravages of enthusiastic picking, as seen here! The neck is mahogany with a slim round-backed profile and an unbound ebony fingerboard decorated with discreet pearl dot inlay. 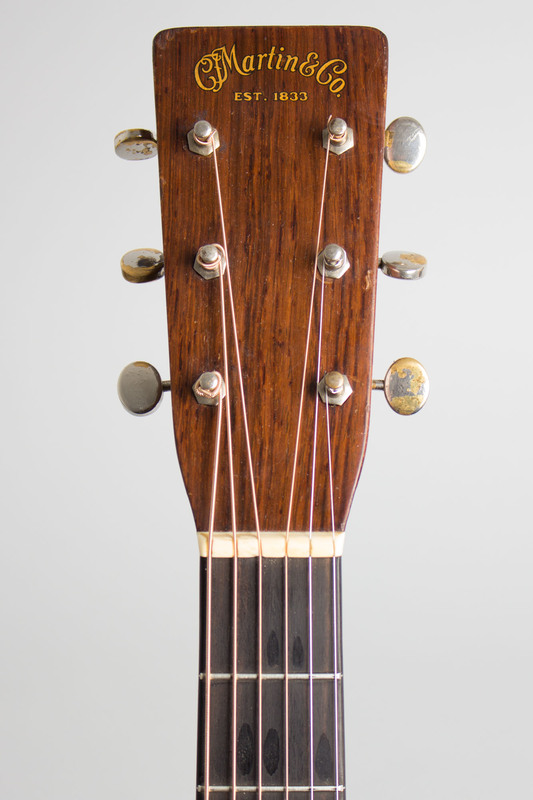 The peghead is faced in dramatically grained Brazilian rosewood with the gold "C.F. Martin & C." decal at the top. 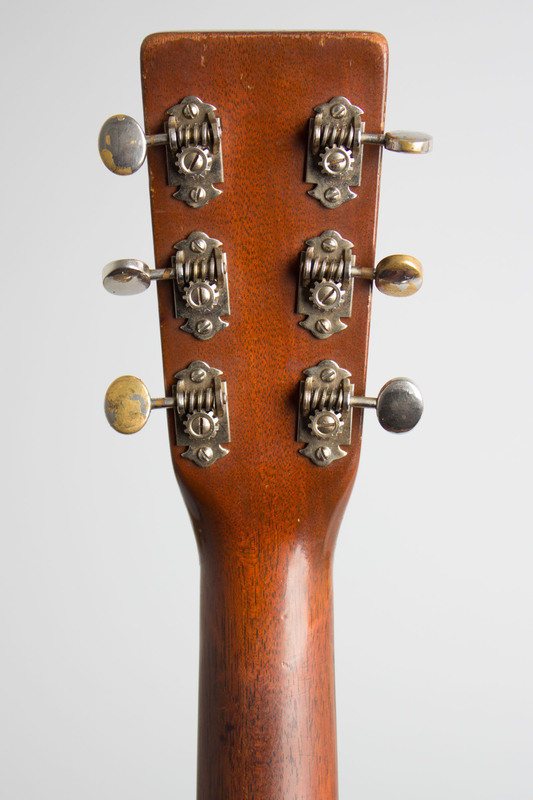 The neck profile is round backed but with the slightest hint of a "V" profile in the way the sides bear away from the center as it moves towards the nut. The tuners are open back individual Waverly units with metal buttons seen only in this period, amazingly still intact and functional even after many years of use. In the minds of most acoustic guitar players, collectors, and historians, very few instruments approach the pantheon of the pre-war Martin Dreadnought in terms of sound and historical importance. Still today, this remains a fantastic performing or recording guitar, with the mellow depth of the Dreadnought mixed with a crisp slightly dry mahogany ring. This is a great pre-war example, played but well-cared for and ready for many more years of service. Overall length is 41 in. (104.1 cm. ), 15 5/8 in. (39.7 cm.) wide at lower bout, and 4 7/8 in. (12.4 cm.) in depth at side, taken at the end block. Scale length is 25 1/2 in. (648 mm.). Width of nut is 1 11/16 in. (43 mm.). This old D-18 has definitely seen some professional use but remains in better -- and far more original -- shape than many. The finish shows wear overall, most obviously on the top where there is pickwear into the wood in front of and behind the pickguard. 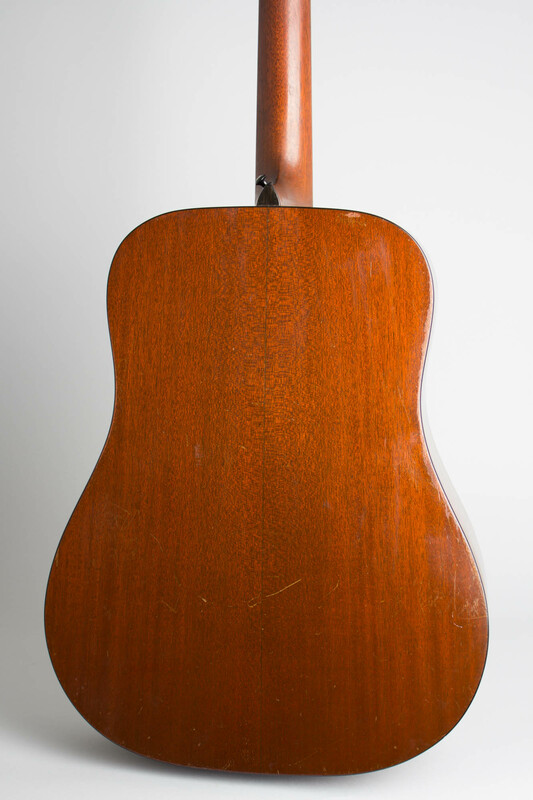 While modern players tend to stay more in the area near the bridge, in the '40s and '50s folks playing into open radio microphones tended to strum more down by the neck, and this one has that "broadcast wear" pattern. The rest of the top finish is actually pretty clean with only small dings, scuffs, and checking. The finish is the original thin lacquer with just one small touch-up over a filled jackhole on the side lower bass bout, just where you'd expect it. 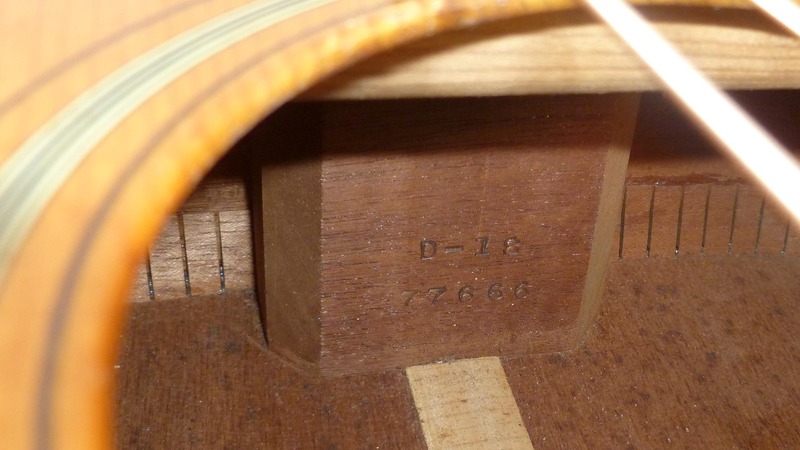 There are two mahogany grain cracks on the treble side shoulder, solidly repaired but visible, with no overfinish added. These do not continue to the heel area, and are not a structural issue. There are no other cracks anywhere, which is actually somewhat amazing. The original, full-height ebony bridge and original maple bridge plate remain in excellent condition with no alterations. The neck is nicely straight, well-set with the correct saddle height. It has been refretted to vintage Martin spec. and the original ebony fingerboard shows some small divots that were cleanly filled when it was levelled. The guitar retains the original nut, the original celluloid pickguard, and the original Waverly tuners, with some plating wear on the buttons. The endblock once had a 1/4" jack installed; this has been filled, but the endpin is no longer original, nor are the black plastic bridgepins. The back of the neck is worn down a bit but has only some small dings and dents. This D-18 is a joy to play; an exceptionally fine guitar that reminds us all why the "vintage" obsession for instruments like this got started in the first place. Excellent - Condition.